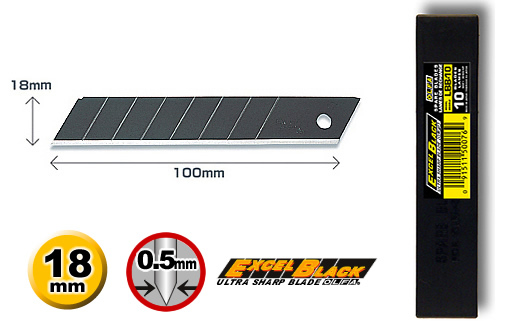 Olfa LBB-10 Excel Black, extra sharp 18mm heavy duty segmented snap off blades in a plastic dispenser. To fit the Olfa PL-1, LL, KL, L-1, L-2, L-3, OL, FL, CL, ML, SL-1, EXL, XL-2, BN-L, BN-AL, NOL-1, NL-AL, CMP-2, CS-1, CS-2, BSR-200, BSR-300, BSR-600, L-5, L5-AL, DL-1 and L-1/green. These will also fit all other types of retractable snap off handles such as the Stanley Interlock, Stanley FatMax. 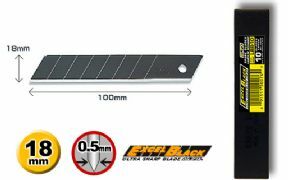 These are razor sharp top quality blades and are perfect for industrial applications such a carton opening, warehousing etc. Also great for scrapbooking, card making, quilting, hobbies, graphic arts and crafts.